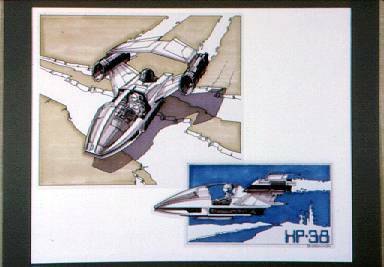 This concept artwork for a sporty update of the landspeeder vehicle, is an imaginative extrapolation of a brief comment of Luke's from the Star Wars script. If you recall, Luke mentions to Ben just outside of the Mos Eisley Cantina that his landspeeder had recently been made obsolete by the debut of a new model. Unfortunately, Kenner got the name wrong--its the XP-38. Or at least it is in my copy of the script.